MoonMarble.com - *Bruce Breslow - "Twisty Cane End of Day - sky blue"
Art Glass → Contemporary Handmade Marbles → *Bruce Breslow - "Twisty Cane End of Day - sky blue"
*Bruce Breslow - "Twisty Cane End of Day - sky blue"
Handmade marble by Bruce Breslow in an opaque sky blue base and containing twisty canes in multi-colors. Approximately 1 1/8" in diameter. 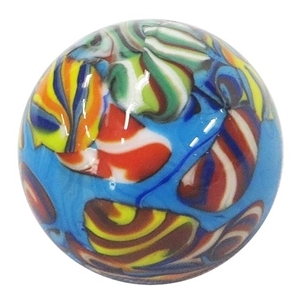 This marble is called "end of day" because the design is made from the scraps of glass and twisty canes that Bruce has remaining on his work table after a day of glassworking. Signed and dated. *Bruce Breslow - "Alien Swirl"
*Bruce Breslow - "Twisty Cane End of Day - green"
*Bruce Breslow - "Tye Dye" Marble"
Ernie Kober - "Ocean Marble on a Penguin Stand"